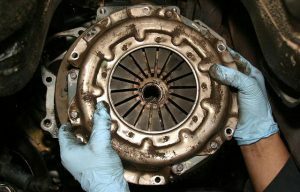 When your clutch is worn out or damaged you will find several things happen. When driving along the engine revs will flare upwards and not match the speed of the vehicle. Another sign of a damaged clutch is crunching when attempting to select reverse gear. A classic sign of a damaged clutch is a bad odor/smell from under your vehicle. We have modern hoists and gearbox jacks and we can replace your damaged clutch and have your vehicle ready for service again. We can service clutches on small family cars all the way through to larger 4 X 4 vehicles. We are also very familiar with the new style of duel mass flywheel systems that are part of many modern clutch setups. If you think your clutch is not operating correctly bring it by and we will check it's operation.